This is the second Noble Vines wine we’ve had in recent weeks, this one a white–not a frequent Saturday night beverage in our house but one to which we both surrendered this evening. 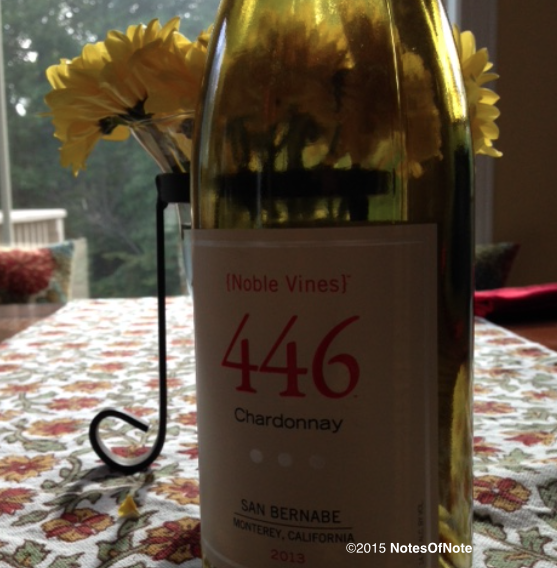 In the interest of time I’ll explain that the 446 originates from the San Bernabe AVA, one termed the “cool climate Monterey” by the winemaker. Your label on the 446 gives simple instructions – “Enjoy with grilled fish, chicken or pasta with creamy sauces.” And we did. Tuna steaks, so fresh and tender, we had alongside orzo pasta, peas, and asparagus. The pasta and vegetables were a contrast in styles and tastes, intertwining hot and cool elements into a great accent for the fish. 2013 Nobel Vines 446 Chardonney, Monterey, California, USA. Fresh citrus is the best way, in my limited vocabulary and experience with whites, that I can describe the 2013 vintage of the 446. It doesn’t have a “buttery” taste to it, and in that way is similar to the Simi that we had not too long ago. In Notes for both I find myself struggling for specifics, for nuances that help differentiate among California Chardonnays and am determined to improve on my palate so as to offer more useful advice on whites in the future. This is not that occasion, though, so let me close simply by saying it brought a smile to my face to know we both were giving a go to the 446 on this sultry Summer evening. Hoping you and yours had a good Saturday too! This entry was posted in Chardonnay and tagged $10-$15, California, california winemaking, Lodi, Monterey, San Bernabe, USA.